Alaska Native News Mar 27, 2015. Western Alaska Alcohol and Narcotics teams from Nome, Anchorage and Kotzebue, as well as DEA, Alaska State Troopers and a Nome police K-9 Unit, carried out a series of raids and buys on Wednesday in Nome, the trooper dispatch reports. 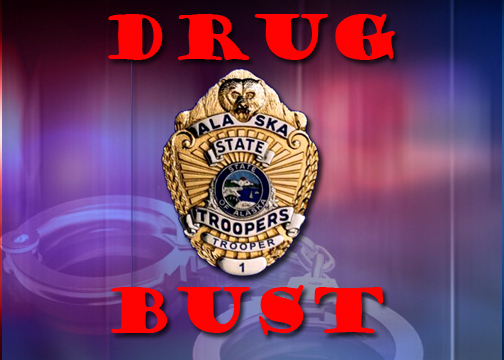 According to the trooper report, authorities carried out two buy/bust operations in Nome as well as served five search warrants on various residences in the northwest community. During the Nome operation, three individuals were arrested on a variety of charges. 27-year-old Darrell Stevens was arrested on 11 felony counts of heroin distribution and possession, while 22-year-old Christian Johnson was booked on eight felony counts of heroin, ethylone, prescription medicine possession and distribution. Aleksei Wilson was charged with four felony counts of heroin and marijuana distribution. All three suspects are listed as being from Nome. Ethylone, is a research chemical and is a reuptake inhibitor and also a releasing agent for serotonin, norepinephrine and dopamine. It is increasingly found in “bath salts,” which were classified in Alaska in 2012 as a Schedule IIA controlled substance. The illegal substance impairs perception, can cause extreme paranoia and impairs motor functions. Individuals abusing the substance sometimes become extremely violent. All three individuals were transported to the Anvil Mountain Correctional Center in Nome where they were remanded.